Ultrasound surgery is a breakthrough technology that is a non-invasive treatment of benign and malignant tumors. It is literally surgery without having to cut one's body or use any form or knives. And recovery time is much faster, immediate results for some. This is specially useful in surgical procedures involving sensitive organs such as the brain (see the second video, highly recommended). Instead of scalpels and incisions, the physician uses mouse clicks and ultrasound. Ultrasound is energy that can go through skin, muscle, fat and other soft tissues. Low-intensity ultrasound waves has no biologic effect on cells or tissues. Low intensity ultrasound waves are used for diagnostic imaging. In ultrasound surgery, on the other hand, high-intensity ultrasound energy is focused on a small target volume inside the body. It raises the target tissue temperature high enough to destroy it. This process of using heat to destroy tissue is called thermal ablation. To identify the target tissue, Magnetic Resonance Imaging (MRI) is used to differentiate the tissues in the area. MRI enables the identifying of the tumor and surrounding organs with high precision. 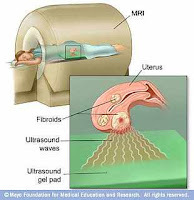 This is called Magnetic Resonance guided Focused Ultrasound (MRgFUS). The process of planning out sending a burst of ultrasound energy to the target is called sonication. In Magnetic Resonance guided Focused Ultrasound (MRgFUS), the procedure uses a magnetic resonance imaging (MRI) scanner to identify tissues in the body. Focused Ultrasound energy is guided and controlled using MR thermal imaging. MRI provides a three-dimensional view of the target tissue, allowing for precise focusing of ultrasound energy within the desired area. With the combination of MRI and focused Ultrasound, physicians can now control the energy of ultrasound to a precise area in the body. The MRI provides the physician a real-time, thermal image of the area being treated. The doctor first sonicates the area to identify and verify the target. The first sonication, raises the target tissue by a few degrees. Once the target is verified, in the second sonication, cycles of ultrasound energy is generated to the target tissue raising its temperature to cause thermal ablation destroying the tissue. Ultrasound surgery can extend the quality of life for many people. Applications for Magnetic Resonance guided Focused Ultrasound are now being applied to people with Parkinson's disease, bone metastasis, breast cancer, prostate cancer, and other diseases.